Some algebraic structures that can be defined on the spaces of paravectors and k-paravectors are studied. Firstly, a version of the exterior and interior products resembling those in the exterior algebra of k-vectors but according to the k-paravector grading is defined. 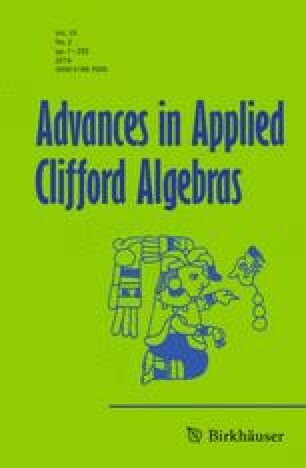 Secondly, a new Clifford algebra is constructed from the operations of exterior and interior products of paravectors and k-paravectors such that if the original vector space has a metric of signature (n, 0), then the metric of this new Clifford algebras has a metric of signature (1, n). The noticeable difference between this new Clifford algebra and usual ones is the necessity of the conjugation operation in its definition. Thirdly, since the space of k-paravectors is not an invariant space under the Clifford product by a paravector, another product is defined in such a way to make the space of k-paravectors invariant under this product by a paravector. The algebra defined by this product is shown to be a DKP algebra. Dedicated to the memory of Waldyr A. Rodrigues Jr. This article is communicated by Rafał Abłamowicz. It is part of the Topical Collection on Homage to Prof. W.A. Rodrigues Jr. edited by Jayme Vaz Jr..
We gratefully acknowledge the support of a research grant from FAPESP—process 2016/21370-9. We are also grateful to Prof. Stephen Mann for reading the manuscript, discussions and suggestions, and to the University of Waterloo for the hospitality during our stay as visiting professor.